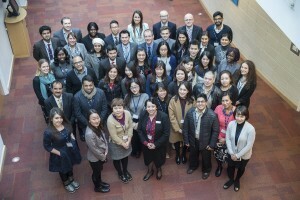 The International Student Recruitment Office was thrilled to welcome 37 key global agents to attend the 4th Surrey Representatives Development Conference, running from the 11th January to the 15th January 2016. Attending three full days of activities, delegates arrived from 22 different countries ranging from China, India, Malaysia, Jordan and Nigeria to name a few. The Conference provides an important opportunity to highlight the unique selling points that Surrey has to offer, update colleagues on new developments and train and educate colleagues in order to provide a better, more informed service to potential applicants. This year’s Conference focused on the ways in which Surrey had achieved the prestigious accolade of ‘University of the Year’ by the Sunday Times. Agents were joined by key professors in the fields of Business, Economics, Politics and Psychology to get a taste of how and what students study. Interactive academic led tours of facilities included the Centre for Languages and Translation, the 5G Centre, and the School of Veterinary Medicine, A showcase for the School of Arts, a participative visit to the Surrey Sports Park and numerous opportunities to meet with key members of staff from across the University were also included in the programme. The week was rounded off with a ‘Very British Evening’ where the agents got to experience all things British including a fish and chip supper, a pub quiz, a ukulele band and a raffle!